Avoid pan burn by rinsing the inside of the pan with ice cold water. Heat milk to a bear simmer until bubbles form around the edge. Stir milk occasionally while it heats being careful not to disturb the burnt milk on the bottom. Remove scum from surface of hot milk. Pour hot milk into new pan or bowl and let cool to 110 – 115°. Transfer 1/2 cup of warm milk to a small bowl and add 3-4 tablespoons plain yogurt and whisk together. 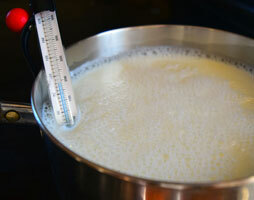 Add mixture to the pot of remaining warm milk and mix well. Cover tightly with plastic wrap and place in oven with oven light on for 6-12 hours. The longer it sits, the thicker and tangier it becomes. Cool in refrigerator and then drain in cheesecloth or a fine wire mesh strainer over a bowl. Serve. For Greek yogurt let drain for 2-6 hours.